Ken Gress, managing agent and owner of the Gress Agency in Vandergrift, is launching a regional charity effort to help provide memorable birthday parties to children from low income families. All proceeds generated during the charity campaign will be provided to local nonprofit organization Beverly’s Birthdays to help fund parties for local children. 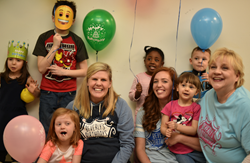 “We want to help Beverly’s Birthdays continue making happy memories for all the children in our community who come from financially challenged families,” said Gress. The Gress Agency is asking all residents of the Vandergrift area to be part of the charity effort by sending in friends and loved ones to receive a complimentary insurance consultation. Ken Gress has pledged to make a $10 contribution to Beverly’s Birthdays in the name of everyone who sends in a referral. More information on how to be part of the event, and a form that allows readers to make suggestions on new charities for the Gress Agency to support, can be found here: http://gressagency.com/rewards/. As a Personal Insurance Representative in Vandergrift, agency owner Ken Gress knows many local families. His knowledge and understanding of the people in his community ensures that clients of the Gress Agency are provided with an outstanding level of service. Ken and his team look forward to helping families protect the things that are most important – family, home, car and more. The Gress Agency also offers clients a preparation strategy for achieving their financial goals. To contact an expert at the Gress Agency, visit http://gressagency.com/ or call (724) 567-6775.